Do you like a big one that you can enjoy with friends? Or do you prefer a smaller one that you can squirrel away till the 25th and devour on your own? Of course, with Christmas around the corner, we're talking about festive food hampers, in particular the ones with F & M printed on the side. Fortnum & Mason sells a wide selection of hampers. They tell us that new hampers are released each year and the approach of their buyers is to offer fresh and inspiring contents, but retain the traditional elements people expect in a carefully edited selection of preserved food and drinks. A Hamper - Perfect Christmas Gift? The great thing about giving a hamper of food and drink as a gift is that it doesn't outstay its welcome. Unlike giving a vase, say, you don't have to worry about a hamper fitting in with the recipient's overblown aesthetic sensibilities. Once consumed, the only trace is a rather attractive basket. Indeed, Fortnum's has experienced a growing interest in giving hampers as gifts over more permanent items. And with the Classic Christmas hamper above you can also start thinking about the Queen's Diamond Jubilee in the new year. Fortnum's has created the Jubilee Truffles and Jubilee Tea, which are included, to mark the celebrations next year. You can skip from one celebration to the next. Chain-celebrating. Fortnum's has supplied food that is ready-to-eat and ready-to-dispatch for almost 300 years. In the 18th century, they supplied hampers for the hungry gentry embarking on long coach journeys from London. In the 18th and 19th century the store’s location provided the perfect site for travellers to collect their hamper for journeys to the South and West of England. Customers could order a boned stuffed roasted chicken, cheeses, beer, a game pie, butter wrapped in lettuce leaves and a fruit cake to take with them. The hampers were supplied with disposable cutlery made of bamboo, pie dishes and bottles needed to be returned. Innovations came out of this necessity to supply easily transportable food and drink. Fortnum's became pioneers in the development of preserved and pre-cooked foods - they reputedly invented the scotch egg, a boiled egg wrapped in sausage meat. You could find one of those delicious things in your hamper by 1756. Walter James MacQueen-Pope, a theatrical historian, felt compelled to mention Fortnum's scotch eggs in his book Goodbye Piccadilly. I feel compelled to pick one up every time I pop into Fortnum's. A Fortnum's hamper accompanied many a British explorer in the Victorian era and early 20th century. One has images of the immense struggle involved in undertaking these expeditions - frost dangling from beards in the Arctic, malarial fevers in the tropics - but it's an interesting contrast to think that a 1922 expedition to Everest was accompanied by Fortnum's hampers containing amongst other items 60 tins of quail in foie gras and four dozen bottles of champagne. That's how to explore. Feature idea: Wherever I Lay My Hamper. 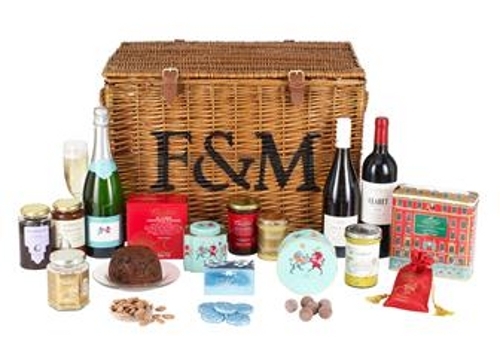 If anyone has pictures of far-flung Fortnum's hampers they'd like to share, drop a line to Tweed Towers.